held at the Greensboro Aquatic Center. 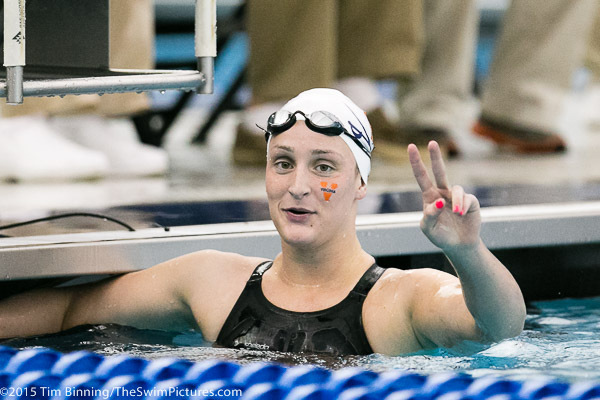 Leah Smith of hte University of Virginia win the 500 freestyle at the 2015 NCAA Division I Women's Swimming and Diving Championships held at the Greensboro Aquatic Center in Greensboro, North Carolina. California Sophomore Missy Franklin shows off her versatility winning the 200 IM at the 2015 NCAA Division I Women's Swimming and Diving Championships held at the Greensboro Aquatic Center in Greensboro, North Carolina. 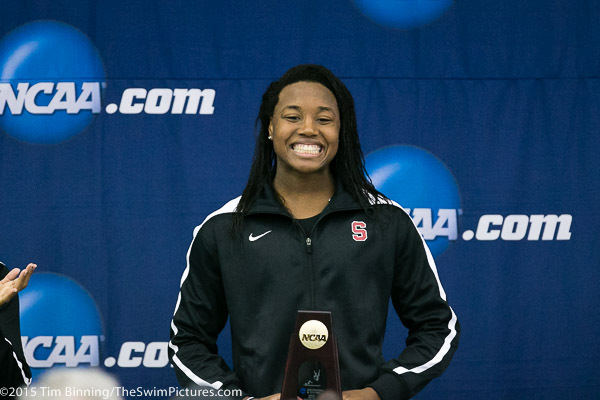 Stanford Freshman Simone Manuel wins the 50 freestyle in 21.32 at the 2015 NCAA Division I Women's Swimming and Diving Championships held at the Greensboro Aquatic Center in Greensboro, North Carolina. 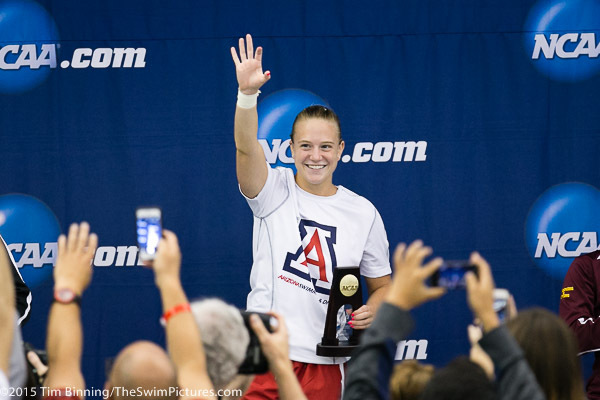 Samantha Pickens of Arizona wins the 1 meter diving at the 2015 NCAA Division I Women's Swimming and Diving Championships held at the Greensboro Aquatic Center in Greensboro, North Carolina. 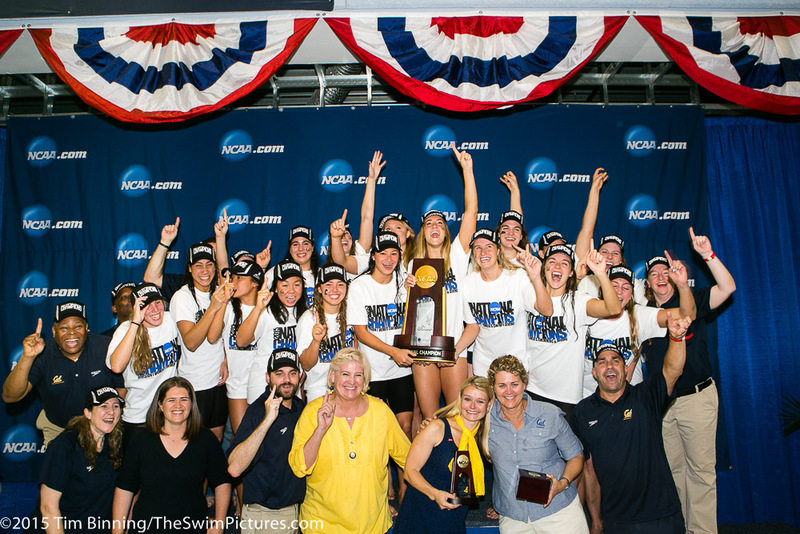 Stanford repeats as 400 medley relay champion with the team of Ally Howe, Katie Olsen, Janet Hu and Simone Manuel at the 2015 NCAA Division I Women's Swimming and Diving Championships held at the Greensboro Aquatic Center in Greensboro, North Carolina. 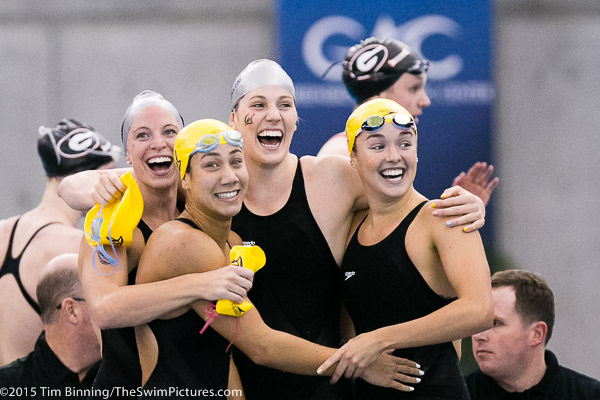 California wins their second relay of the championships as the team of Rachel Bootsma, Marina Garcia, Noemie Thomas and Farida Osman go 1:35.15 in the 200 medley relay at the 2015 NCAA Division I Women's Swimming and Diving Championships held at the Greensboro Aquatic Center in Greensboro, North Carolina. 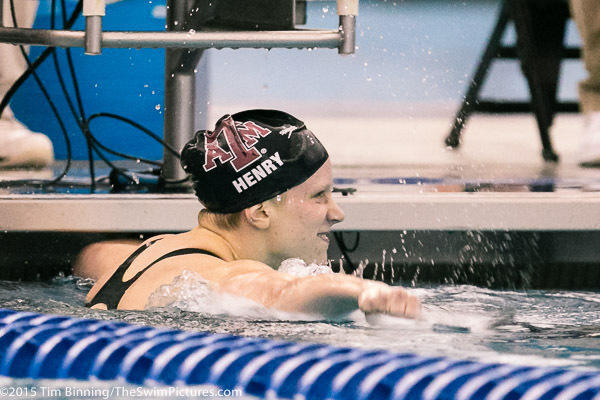 Senior Sarah Henry of Texas A&M sets a pool record 4:02.47 in winning the 400 individual medley at the at the 2015 NCAA Division I Women's Swimming and Diving Championships held at the Greensboro Aquatic Center in Greensboro, North Carolina. 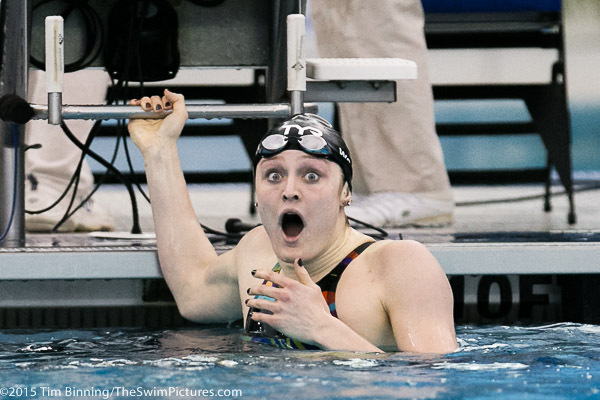 Louisville Junior Kelsi Worrell sets an American record 49.81 in the 100 butterfly in winning the event at the 2015 NCAA Division I Women's Swimming and Diving Championships held at the Greensboro Aquatic Center in Greensboro, North Carolina. 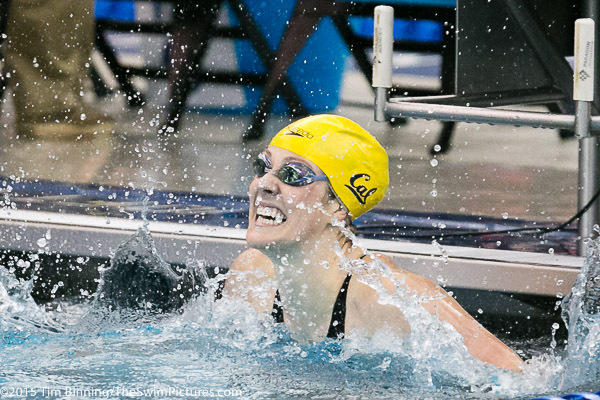 California Sophomore Missy Franklin repeats as 200 yard free champion in 1:39.10, smashing her American record set the previous year at the 2015 NCAA Division I Women's Swimming and Diving Championships held at the Greensboro Aquatic Center in Greensboro, North Carolina. 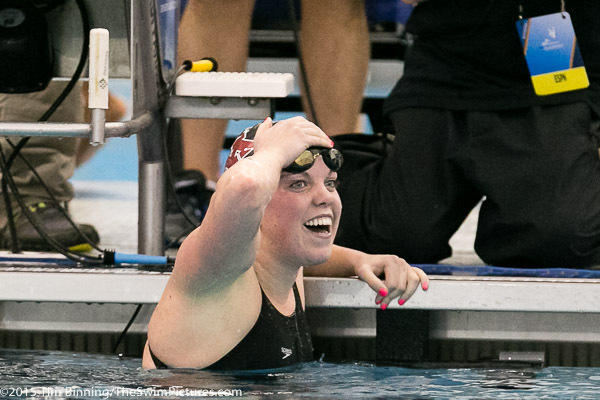 Stanford Junior Sarah Haase wins the 100 yard breaststroke in 58.32 at the 2015 NCAA Division I Women's Swimming and Diving Championships held at the Greensboro Aquatic Center in Greensboro, North Carolina. 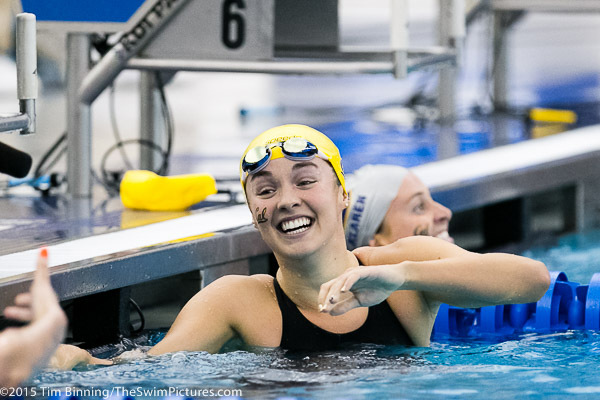 California Junior Rachel Bootsma wins the 100 yard backstroke in 50.03 at the 2015 NCAA Division I Women's Swimming and Diving Championships held at the Greensboro Aquatic Center in Greensboro, North Carolina. 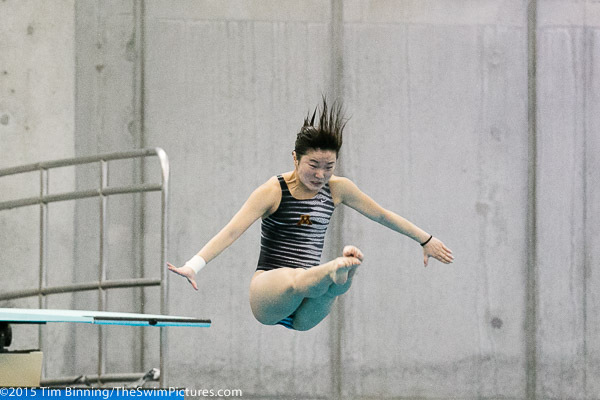 Minnesota Sophomore Yu Zhou wins the three meter diving at the 2015 NCAA Division I Women's Swimming and Diving Championships held at the Greensboro Aquatic Center in Greensboro, North Carolina. 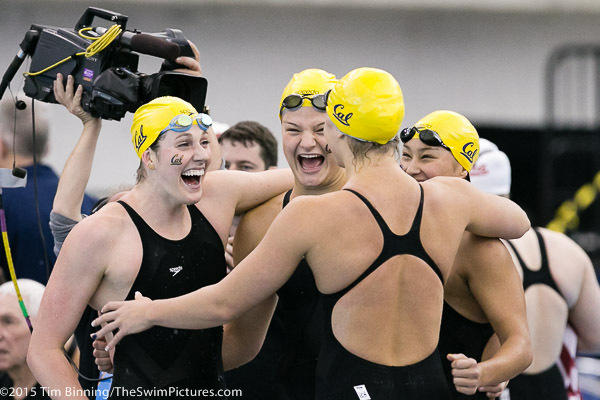 The Cal Berkeley 800 free relay of Cierra Runge, Camille Cheng, Elizabeth Pelton and Missy Franklin celebrate victory at the 2015 NCAA Division I Women's Swimming and Diving Championships held at the Greensboro Aquatic Center in Greensboro, North Carolina. 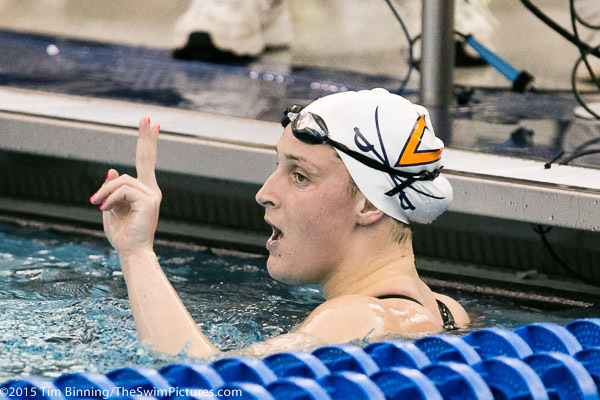 Leah Smith of Virginia follows upon her earlier 500 free victory with a win the the 1,650 free at the 2015 NCAA Division I Women's Swimming and Diving Championships held at the Greensboro Aquatic Center in Greensboro, North Carolina. 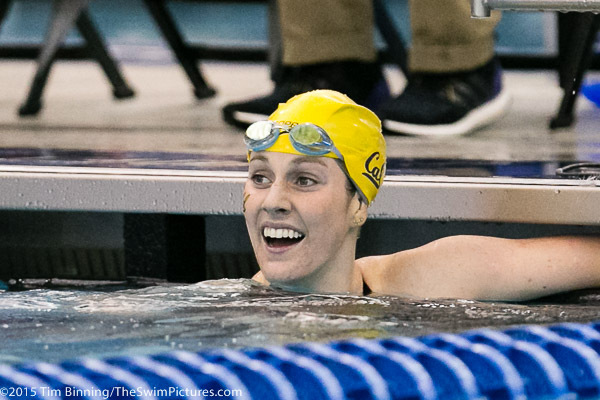 California Sophomore Missy Franklin in her final collegiate competition before turning professional wins her third individual event taking the 200 back in 1:47.91 at the 2015 NCAA Division I Women's Swimming and Diving Championships held at the Greensboro Aquatic Center in Greensboro, North Carolina. 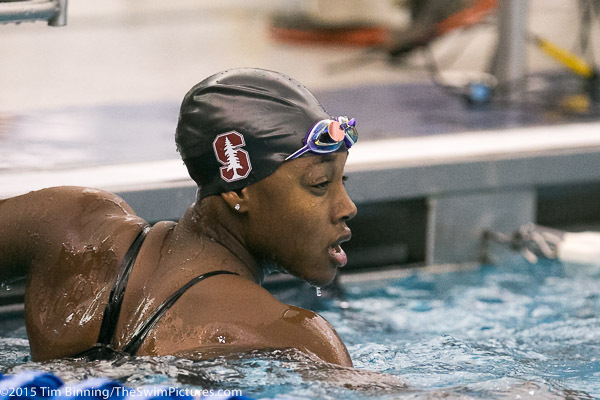 Stanford Freshman Simone Manuel follows up her 50 free victory with an American record victory in the 100 free going 46.09 at the 2015 NCAA Division I Women's Swimming and Diving Championships held at the Greensboro Aquatic Center in Greensboro, North Carolina. 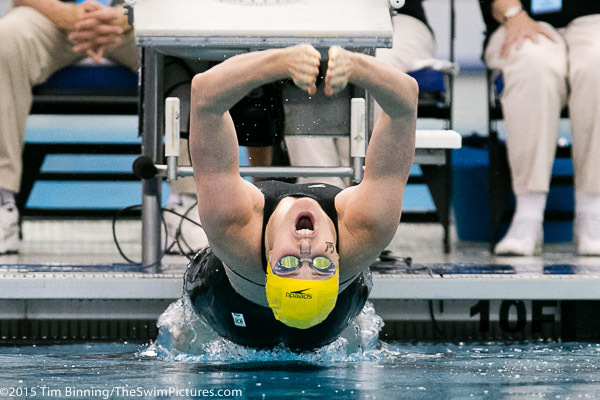 Kierra Smith, a Minnesota Junior, wins the 200 breaststroke in 2:04.56 at the 2015 NCAA Division I Women's Swimming and Diving Championships held at the Greensboro Aquatic Center in Greensboro, North Carolina. 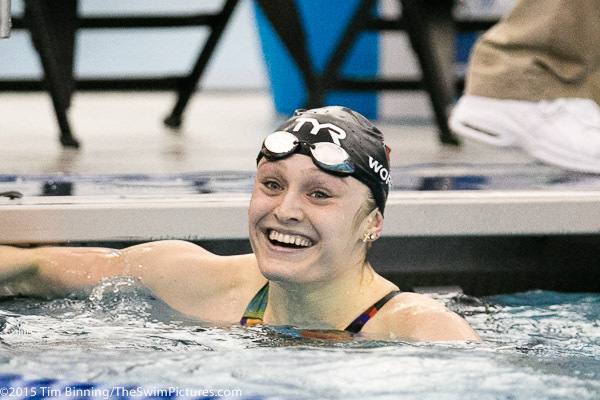 Louisville's Kelsi Worrell adds the 200 butterfly championship to her earlier 100 butterfly victory going 1:51.11 at the 2015 NCAA Division I Women's Swimming and Diving Championships held at the Greensboro Aquatic Center in Greensboro, North Carolina. Jessica Parratto of Indiana wins the Platform diving at the 2015 NCAA Division I Women's Swimming and Diving Championships held at the Greensboro Aquatic Center in Greensboro, North Carolina. 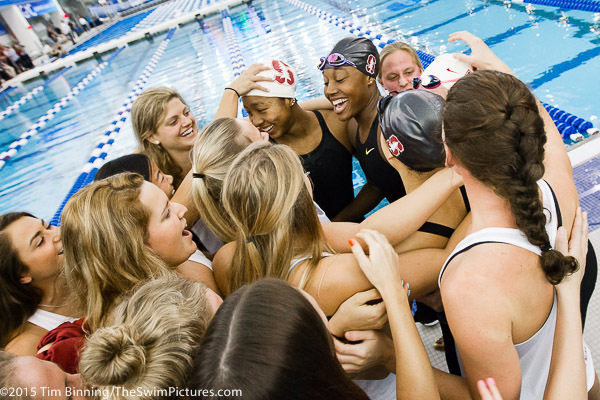 Stanford repeats in winning the 400 yard freestyle relay as the team of Lia Neal, Janet Hu, Lindsey Engel and Simone Manuel swam an American record 3:08.54 at the 2015 NCAA Division I Women's Swimming and Diving Championships held at the Greensboro Aquatic Center in Greensboro, North Carolina.